Each year the Rotary Club of McHenry and the Rotary Club of McHenry–Sunrise offer Rotary Youth Leadership Awards to high school students who exhibit leadership qualities. Generally, three students from each of McHenry Community High School – East, McHenry Community High School – West, and Johnsburg High School are selected to attend a weekend of leadership training. 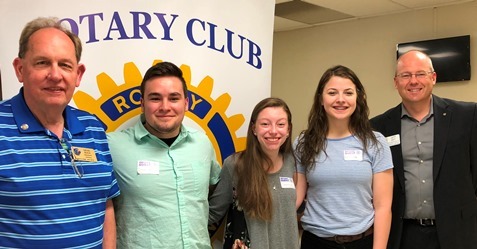 At the Rotary Club of McHenry Noon meeting on May 10, 2018, Jeff Batt (RYLA coordinator and member of the Rotary Club of McHenry–Sunrise) brought three Rotary Youth Leadership Award recipients who attended the RYLA weekend of leadership training. These included Savannah Gunderson (Johnsburg High School), Dylan Qualls (McHenry High School, East Campus), and Hannah Wulf (Johnsburg High School). Jeff Batt explained various aspects of the RYLA program. Each of the three students shared memorable aspects of their experience at the RYLA weekend of leadership training, as well as how each felt it helped them become more refined and effective leaders. As they continue their postsecondary education, each believed that the RYLA weekend of leadership training has provided meaningful preparation for future leadership.